Pre-pregnancy I’d never heard of a baby wrap let alone know that there was a whole industry dedicated to them. And although they cropped up on my radar during pregnancy I still didn’t give them much thought. In all honesty, I thought they were a bit of a gimmick. Fast forward to life with a 3 day old baby who when he wasn’t feeding or sleeping, just wanted to be held and baby wraps started to look very appealing. Now I did already have a baby wrap, thanks to the Scottish Baby Box (see my review here), and I managed to successfully use it around the house and on a few brief trips out but I still wasn’t convinced of the functionality of wraps overall. I know now, with the benefit of hindsight, the free Scottish Baby Box wrap was just too heavy for me and I didn’t feel it supported James well. I also noticed that no matter how tight I tied this wrap, it would go slack and would later need readjusting. The lovely Laurna, a baby-wearing consultant and Joy and Joe Admin & PR unicorn from Coorie in with Love, got in touch via Instagram to offer some advice on which wraps might be more suitable and kindly arranged to send me the Joy and Joe Bamboo wrap to review. The Joy and Joe Organic Bamboo Stretchy baby wrap in Black is the newest addition to their range. This wrap retails from £38 , comes in a variety of colours, and can be used from birth. In the box you receive the baby wrap, an adorable matching hat, a carry bag, and a detailed user manual including instructions on how to tie the wrap. The wrap is made of eco-friendly, organic bamboo material, which is hypoallergenic and antibacterial, and thus is very lightweight and soft. Space Saver: The first thing I noticed was how lightweight the wrap was despite how much fabric there is. It folds up neatly into its own carry bag and really doesn’t take up much room in the changing bag so its handy to take out with you on the off-chance you might need it. Comfort: Because the Joy and Joe baby wrap is so lightweight and soft, I find it to be incredibly comfortable to wear (I’ve even fell asleep wearing this wrap) but it still feels like it’s supporting James. The wrap fits neatly onto my frame so doesn’t look or feel bulky, which means I’m more inclined to wear this for most of the day, ready for when James needs to be popped into it. Calm Baby: On the days he is cluster feeding, James can be a little grouchy and want to be held more. The first thing I noticed with baby wearing in general was that James is instantly calmer in the wrap and when he’s tired, he’ll fall asleep faster. For me this proved to be a lifesaver when he’s missed a nap or just will not settle for a sleep. I pop him in the wrap, get on with whatever I’m doing, and he’ll conk out instantly. Deep Sleep: James also sleeps more soundly in the wrap, and even when I unwrap him and place him in his crib, he doesn’t fully wake up. I wonder if perhaps he falls into a deeper sleep faster? Breastfeeding: I can breastfeed in the Joy and Joe baby wrap with relative ease. The stretchy material means I don’t have to loosen and then re-adjust the wrap to feed James, which is ideal for when we’re out and on those cluster feeding days. Even if James falls asleep after feeding, because I can nurse him in the wrap, I don’t need to worry about waking him by pulling him in and out. Out and About: 99% of the time we take the car for any trips with James however the general advice is not to leave newborns in their car seats for extended periods of time. So while he’s still very wee I find it useful to use the wrap on trips out with James because it gives him a break from sitting in the car seat. Less Handling: Again, while he’s so wee, I do like the fact that when James is in the wrap people are less likely to want to handle him (and lets face it, being passed around from person to person can’t be fun for a newborn eh?) Maybe this sounds like I’m being a possessive Mother or maybe its just my child, but James gets grouchier, faster, when constantly passed around. Skin to Skin: Never underestimate how a little skin-to-skin time can calm a baby. Even if I don’t have time (or if I have visitors) to strip down for skin-to-skin, if I wear a low cut top while wearing the wrap, so James’ head is against my chest, and a cardigan or shirt over my shoulders it still seems to have the same effect. Shopping: I’ve still to work out the logistics of supermarket shopping with a newborn in tow: the car seat takes up the entire trolly & how do you push a pram & a trolly? Answer: a baby wrap. If I wear the wrap before we set out, I can transfer James from car seat to wrap in the back seat of the car easily, and he’ll stay chilled out for the duration of the trip. Leaving me hands free to mosey around the shops at my leisure. Hands Free: Most importantly, baby wearing means I can be hands-free. I never fully appreciated just how much a newborn would want to be held & how this can interfere with the most basic of tasks. When James is in the wrap I can brush my teeth, apply make up, eat with BOTH hands, and I’ve also mastered the art of going to the toilet with him strapped in (yes, parenting is THAT glamorous). Trips to coffee shops (aka, the standard Mum on maternity leave outing) are also significantly easier when I know he’ll be calm and relaxed by popping him in the wrap. I hesitate to call these low points because, honestly, its nothing that should be off-putting its more….logistics to figure out. The Art of Tieing: Tieing the wrap and getting your baby into it for the first time can be a little daunting however you shouldn’t be put off if you end up making a hash of it first time round. If you’re finding it tricky then watch some YouTube videos and practice in front of a mirror until you’re confident its secure. Then practice getting your baby in and out while he/she is calm and relaxed. 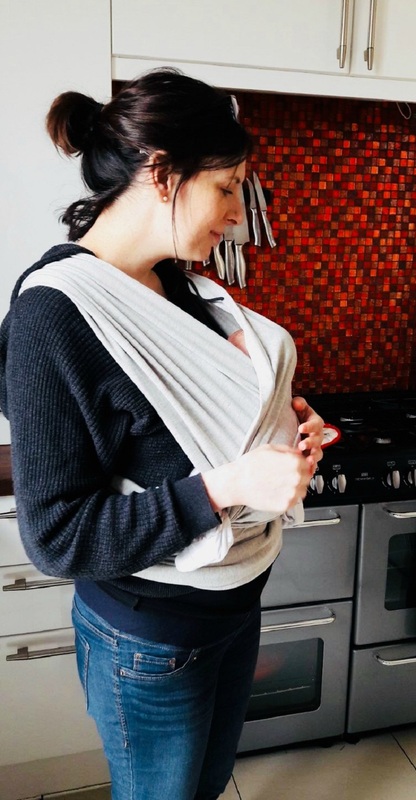 If you’re nervous about wearing your baby in the wrap while out, then build it up slowly: wear it around the house or in a restaurant/cafe and with time you’ll be confident enough to wear it out for a walk. 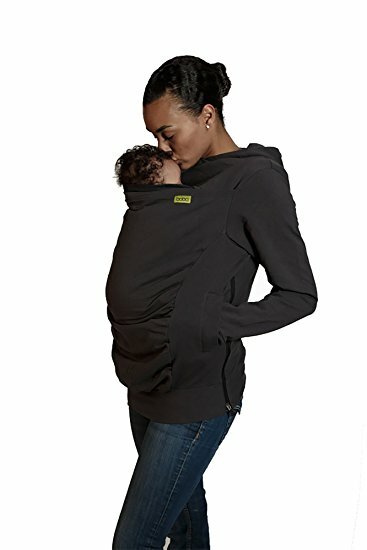 Warmth: While on the subject of baby wearing while outdoors, you might also want to consider buying a special baby wearing hoodie or jacket. However these can be a little pricey relative to regular hoodies and jackets. Yes you can zip the baby into your regular coat, but in my experience the coat or hoodie/cardigan needs to be a little larger to accommodate the baby. My advice would be to wait and see how often and when you use the wrap, then decide if you need this item. For example, if you only use the wrap around the house then chances are you won’t need a dedicated cover up. Speed: As straightforward as the wrap is to tie with a little practice its not as fast to get on & off as a buckle carrier. So until you’re a whizz at tieing the wrap I suggest wearing it before you head out. For new parents the world of baby wearing can feel like a minefield to navigate. 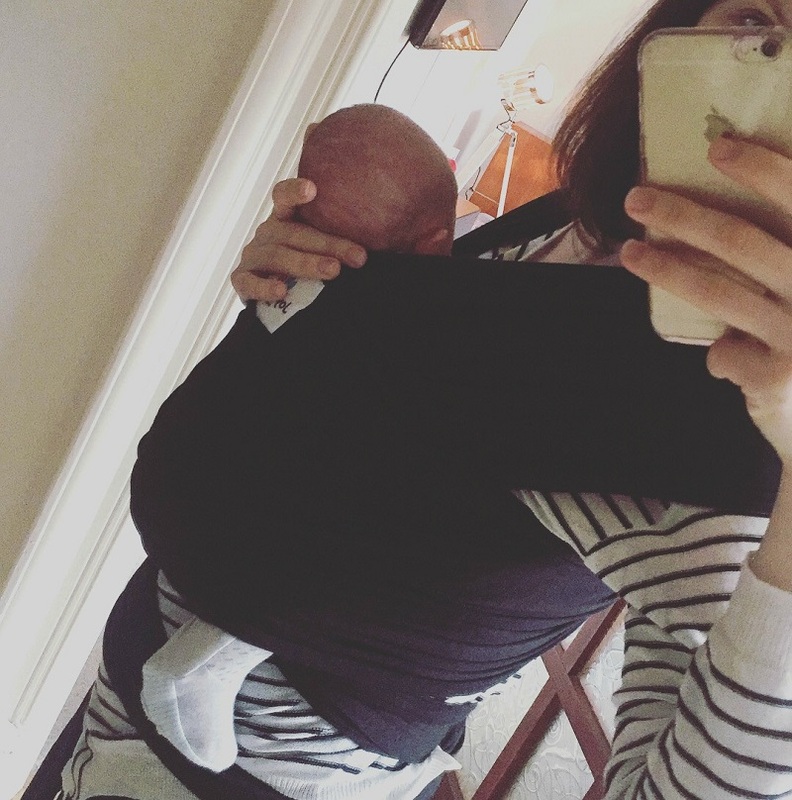 If you are keen to invest in a baby carrier then I suggest checking out if there is a sling library in your local area. These give you the opportunity to try/hire a variety of different wraps/slings/carriers before you buy, and most good sling libraries will be able to provide advice on the best option for your needs. If you are based in or around Inverness and keen to find out more about baby carriers then check out Coorie in with Love here. Disclaimer: Joy and Joe kindly provided me with the baby wrap to review, as arranged by Coorie in with Love, for which I am very grateful for, however all views and opinions expressed here are my own, and I have no paid relationship with either organisation.